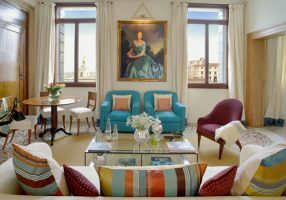 Guests love these three lovely apartments in a noble palazzo the heart of Venice. Recently renovated with fine taste that cheerfully combines antique heirlooms and bright modern touches. Location is wonderful right on the Grand Canal; guests arrive to the palazzo’s private dock and entrance. The location within Venice is fabulous, a 6 minute walk to Saint Mark’s piazza and cathedral, 13 minutes to the Rialto bridge. Guests are pampered with a delivery of warm croissants each morning.